I did look up SNR and it seems the higher the better, so does this mean either bitswap or SRA improve the stability of a line? I'm hoping that one pixel of packet loss since the second D/C is just a one off, because overall it looks much better. I'm just wondering if there's some trade off somewhere, much like how interleaving attempts to stabilise the line at the cost of performance. Most of the results from Google searches on SRA or bitswap are confusing and generally contradictory, with many claiming they apply to ADSL only. Yet many people post in depth modem stats on FTTC connections which show a bitswap stat/numerical value. Any ideas? I to am with TT. And have a similar line and speed to yours. The speeds that are showing upstream and downstream, do you actually get those speeds when you do a speedtest??? I caant seem to get near what mine says!! I haven't done a wired test for a good while (not since I switched and my max speeds were lower, since switching from 50/10 on BT) but on WiFi my download hovers around 68-71Mb and my upload is always spot on. I just find it weird that I can't get 80/20 because my cabinet is a stone's throw away. I mean, I could genuinely throw a stone from my kitchen window and hit it LOL. I guess the distance from the exchange is also a factor then? I to can throw a stone and hit my cabinet!!!! Most ive got via wifi is 50 down and 15ish up with a ping of around 15ms throught the R1. After reading your post I took a look at my tp link Archer vr900 settings and the bitswap and sra were both ticked. I started a new plot because I'd swapped out my W9970 to the TalkTalk WiFi Hub and the IP changed. There wasn't any packet loss since starting that new one (except for the dot after the big spike around 5am), but there had been prior to swapping out the modem while using bitswap. I saw the dropout so I decided to try out the test socket behind the faceplate with an RJ11 cable plugged into a microfilter (the resync is the second red spike on the end there), and I used that downtime as an excuse to plug the HG612 back in since I prefer having a modem in bridge mode anyway. The minimum latency seems to have gone up despite removing a hop from the setup (only a couple of ms, but still) which doesn't seem like a good sign off the bat, but the main idea of this is to see if there are any further dropouts. 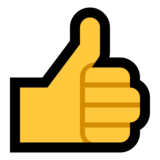 I've been looking around online and I've seen people suggest trying a new modem, trying the test socket, and checking their SNR. One person had a margin of 3dB and was requesting TalkTalk to somehow force it to 6dB to stabilise the line. Is that the problem here? Unlike most of the people who take to forums with complaints of daily disconnections, my speeds haven't dropped at all... they're still 70+/20. My head hurts ¯\_(ツ)_/¯ my swapping modems every now and then isn't good but, to be fair, my modem up time after switching to TalkTalk was 29 days and the DSL uptime was never any more than 5-7 days anyway. Talk talk are having a few issues at the moment. This was my Ping Plotter a few weeks back. My fix was to turn off my modem for over 20 minutes so DLM does not see it as a line drop. Start the modem back up and re test. In the end I had to do this twice, changing IP did the trick. I had my modem off for 35 minutes last time and when I swapped it out for a different one, I deleted my BQM expecting it to see a new IP. It was the same for some reason. Am I thinking along the right lines by trying out the test socket? It's obviously an ISP issue but at least this way I can prove it's not the wiring past that point where it leaves their responsibility. I tried playing after getting the modem back up and running and it was fine for one game, before becoming a mess again. I just don't know what to do anymore. Billion modems and asus dsl modem/routers such as the DSL-AC68U allow you to adjust bitswapping and SNR settings. I had a dabble fiddling about with it when I was on BT. 6db is the ideal position but it has to be a very good quality line. 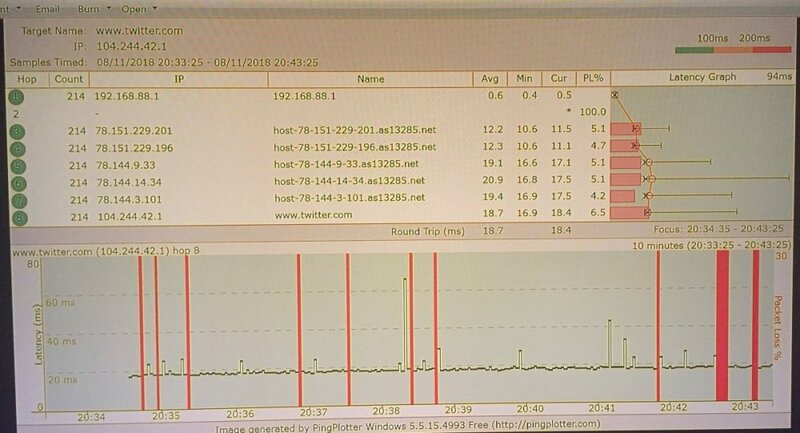 As you can see from my ping plotter the issue starts at their network hop. I would turn off again for over 20 minutes and see how it goes like I did. I have no issues now pings with no spikes and no PL. They wanted to send out an engineer, yeah right. I read somewhere that low SNR is fine as long as the line is exceptional. I'm not sure that can apply to me, but I am very close to the cabinet and get almost exactly what my line tops out at. But that begs the question - why can't I get 80 down if the cab is a stone's throw away? Is that simply down to the distance to the exchange? I found it interesting that enabling bitswap on the W9970 increased the SNR on the upstream but nothing really changed in the way of performance. If high SNR margins are better I guess it makes sense that I get the full 20 up but not 80 down. That said, I've also skimmed across forum posts and articles saying that the Openreach network was rolling out "3dB connections", whatever that means. When the house is quiet and I don't need to be online next, I'll turn the modem off and leave it off for half an hour or so. Last night while I was wired up with the laptop I double checked its settings, made sure QoS/firewall/unnecessary ATM and PTM settings were off and dropped 802.1p from 2 back to 0 since I don't use IPTV, so I can't think of any reason to reboot it again. Then when it pulls another IP (hopefully) I'll set up a new plot and just observe. They are using 3db also now if your line has low noise and does not bite much into any of the 6db. Two reasons to have a higher SNRM your line has noise and the DLM will set you to 9db if you still have noise issues it will set it to 12db etc you will have the associated loss of bandwidth per SNRM jump. The other reason is you are close to the cabinet and you are syncing at the max rate and you could in effect have more bandwidth so you get an overhead of SNRM instead so you may have 12db if you are next to the cab. Oh gotcha. Is that why my modem stats say my line's max rate on the upstream is 24Mb, for example? I've never ever ever heard of anyone on VDSL2 getting more than 20Mb. The downstream is odd though. If it's "low noise" (hence the 3dB) and I'm next to the cab, surely I could expect the full 80Mb or thereabouts. I guess an increase of 20%+ on upstream SNRM using bitswap is a sign I shouldn't use it then. Sync is always higher than throughput, you do not need to use bitswap. Sorry I'm a bit confused... no amount of coffee could shake off the cobwebs on my brain today lol. Were you asking if I was using the old Netduma firmware with the TP Link? I actually tried both but when I made this thread I was back on DumaOS. Before upgrading I unticked all of the miscellaneous settings on 1.03.6j, but I don't think deep packet was enabled anyway. 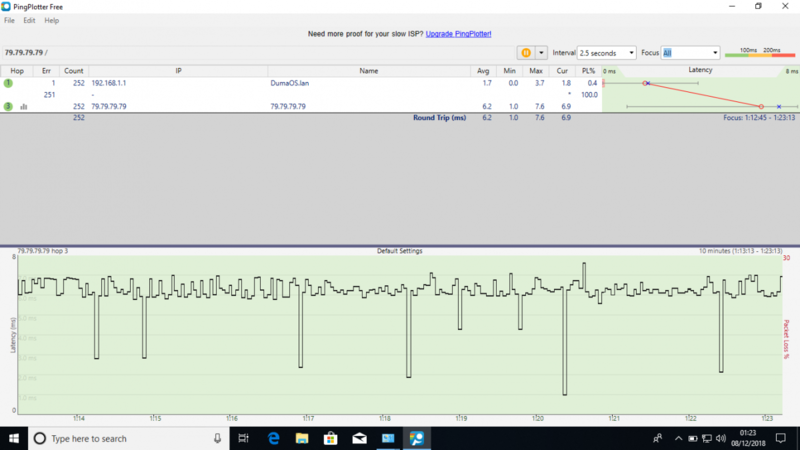 Could be a coincidence but what really seemed to fix that packet loss was swapping the modem again and changing the 802.1p WAN setting on the HG612. Apparently for TalkTalk you should use anywhere from 0 to 2, but I tried 3 and had zero packet loss for 48 hours until I tried another setting. But none of those settings seemed to help the constant lag I've got in my games, even in custom games vs bots, so I just reset the HG612 back to factory defaults and gave up. The problem on that PingPlotter screenshot is everything from hop 3 onwards. Hop 2 showing up to 100% packet loss is normal, at least as far as I can tell from my time on both TalkTalk and BT. The loss starting at hop 3 is what carries on down to the final hop, hence the red bars on the bottom half of the page. It was hop 3 on TT network where the issue started. Hop 2 is my modem which is not responding to pings. Oh hop 2 is the modem? I always thought it was something on their end (the ISP) that just didn't place a high priority on ICMP replies. I've noticed if you run a modem in bridge mode and then a router, you get just one of them appearing on PingPlotter and the first hop is marked by stars on the Netduma diagnostic test trace route, whereas if you have a combo behind the R1 you see the first hop with like 0.5ms latency. Veering off on a slight tangent, do you know why latency can be so low to the modem on the Netduma diagnostic test but if I connect a laptop to the R1 and run a PingPlotter test my first hop latencies are a bit all over the place? I've been running tests with brand new short cables and regardless of the R1 port I use, I never get the typical latency inside the LAN of <1ms... it's usually an average of 3 or 4ms, with spikes into the double digits and a minimum of 2.5ms. Something wrong with my R1 ports? Edit: I don't have any PingPlotter screenshots handy to illustrate what I mean, but I do have this one which I sent to my phone a while back. What the hell are those "inverse" spikes all about? 0.0ms minimum? 1ms minimum to an IP based in Scotland? Very weird stuff.